Produce more credible, higher quality reports that impress your clients and showcase your expertise with this new book! Plus, learn how to disclose and disclaim items so that you limit your liability and protect yourself without upsetting your clients. 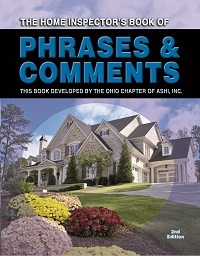 The Book of Phrases has over 6,000 phrases and comments compiled by seasoned home inspectors. *OREP Insureds save $30! Shop your E&O with OREP today!